I have a few daily routines that I have mentioned in previous blog posts and here is yet another small but very significant part of my day that truly helps keep me focused, healthy, and running on tons of energy. This little wellness shot can be made at home or in many supermarkets that have a natural health food section like Key Food on Ave. U & 66th Street in Brooklyn, NY. This here is my ginger, lemon, orange, cayenne shot. It is a little pick me up that I take in the morning on alternating days when I don’t have a wheat grass shot. I wanted to mention just a few benefits to keep in mind for your next morning when you get a chance to juice these ingredients. The ginger in this shot is a natural remedy for an upset stomach and gives wonderful digestive relief. It also warms you up and helps to less any aches or pains you may have, especially those that can be onset by a cold or flu. Ginger naturally breaks apart mucus build up and relieves sore throats. The lemon is a natural dose of Vitamin C to help your bodies immune system stay on point. Cayenne pepper is yet another amazing remedy for cold or flu systems or just a way to perk up your body’s energy level. It helps with circulation, nausea, among many other symptoms. 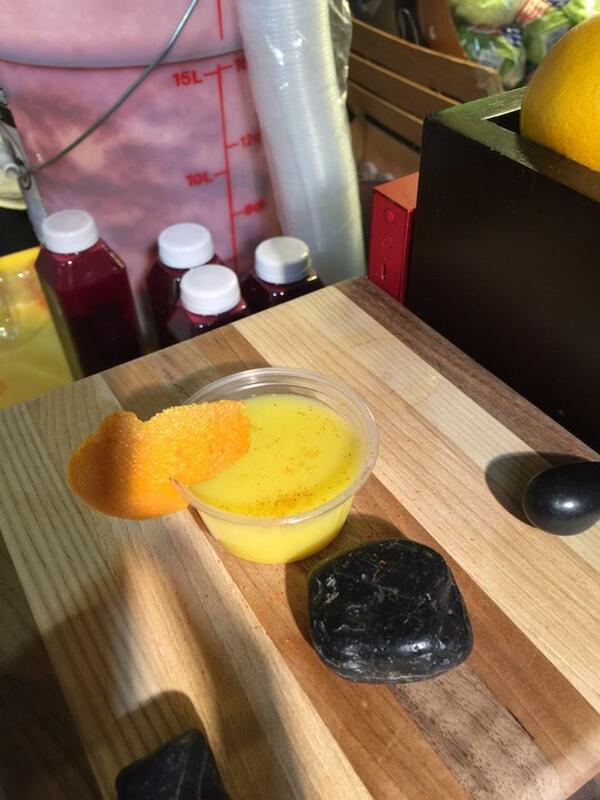 The orange slice as your chaser is just another little bonus with an extra dose of vitamin C!